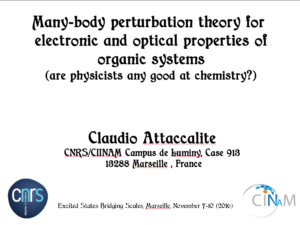 My new talk on Many-Body Perturbation Theory (MBPT) in chemistry is online. If you want to know what MBPT can do in finite systems have a look to this talk. There is an historical introduction and then I discuss different approximations as GW, BSE and present applications in organic chemistry. More recent progresses are presented in the last part of the presentation. If you like this presentation you can download the LibreOffice from Slideshare. This entry was posted in optical properties, research on 27/10/2016 by attacc. On page 24 : QSGW performance is quite disappointing on such small molecules. The presented data (Kaplan et al) in the figure are unfortunately not fully converged with respect to the basis set. The errors of IPs based on QSGW relative to experimental IPs are of about 0.5 eV(! ), if a much larger basis set is used (aug-cc-PV5Z). Unfortunately performance of GW+BSE within all of its flavors on excited states of water, ammonia, hydrogen fluoride, and many other small molecules is quite poor relative to EOM-CCSD. On page 26, a multi-reference problem is treated by the single reference GW+BSE approach. I like to know how you would give a real multi-reference character to the GW+BSE approach, like DMRG ? Further, organic chemistry is interesting, but radical and transition metal chemistry is much more interesting from chemist point of view. You can test a possible multi-state GW+BSE implementation on excited states of H2 at increasing bond lengths. It would be fantastic if GW+BSE would replace CASSSCF, MRCI, and other highly costly quantum chemistry methods. I agree about your points. The QSGW does not help to improve results, and I’m aware of the poor performance of GW+BSE in small molecules. The results on page 26 are not GW+BSE, but Dynamical-Mean Field Theory (DMFT) that is a method that can deal with milti-reference problems. I changed some slides according to your remarks, to make them clearer. It remains to prove if it can deal with static correlation (multi-reference) in excited states or not. I have there my doubts.